Noordwijk is a modern seaside resort in Zuid-Holland, with a vast sandy beach, bustling promenades and an atmospheric village centre. Noordwijk lies right in the heart of the bulb flower region and is comprised of Noordwijk aan Zee and Noordwijk Binnen. Noordwijk is the ideal place for a great day out or an enjoyable holiday. Noordwijk lies on the coast in a magnificent area between Katwijk and Zandvoort. The village boasts a fine beach with vast dunes and wooded areas. In spring, the bulb flower fields transform the area into a sea of colour. Noordwijk is easy to reach by car or public transport. Noordwijk does not have its own railway station, but the train stops at nearby Voorhout, from where you can take the bus to Noordwijk. Noordwijk is an ideal place for a relaxing peaceful break, as well as for sports activities all year round. There are countless activities, such as kite surfing, sailing, kite flying on the beach, horse riding or walking through the dunes. The village has an annual flower parade, held on the promenade of Noordwijk, with many different vehicles taking part, such as floats, and cars including old-timers, all beautifully decorated with flowers. The Noordwijk lighthouse, located on the Koningin Wilhelmina promenade near the Vuurtorenplein square, is made from brick and reinforced concrete. The lighthouse has six floors and a staircase with 108 steps. Since 1980, the lighthouse has been declared a national monument and is only open to the public on special occasions such as the Open Monument Day. 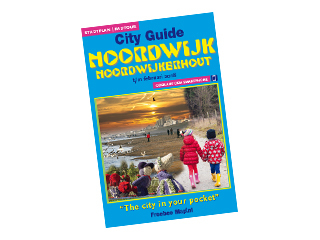 If you wish to see the best places in Noordwijk, you can do the cycling route from the Freebee Map in the brochure that you can order from this website by means of an SMS service. Then you can be certain that you have seen all there is to see in Noordwijk. The Atlantikwall Museum, located in a former German ammunition bunker on the Bosweg in Noordwijk, with exhibitions including more than 200 photographs. Noordwijk is a great place to shop, with the main street of Noordwijk aan Zee near the promenade. The Kerkstraat in Noordwijk Binnen is also worth a visit. In the centre of Noordwijk, you will find a succession of shopping areas, as well as many places for a bite to eat or a drink, all different and all with their own character. Noordwijk offers a wide variety of shops with something for everyone. Noordwijk has plenty of choice for eating out. Noordwijk has everything to offer hedonists as well as connoisseurs. Noordwijk has a wide variety of characteristic outdoor cafés, cafés and restaurants, many with a view of the sea or the dunes. Most of the restaurants are located on or in the area of the promenade, with something to suit everyone’s taste and budget. Watch the sun set at one of the beach pavilions while enjoying a drink. The centre also has many atmospheric restaurants, cafés and outdoor cafés. There is also plenty to do in the evenings in Noordwijk, either a visit to the cinema, a theatre performance; or an enjoyable evening out at one of the many pubs or cafés. In the summer months, there is something organized in Noordwijk for almost every day, such as tourist markets, folkloristic days and sporting events. The events calendar on the Freebee Map gives an overview of events going on in Noordwijk and Noordwijkerhout.